Hotels are staying sustainable with these clever, yet simple ideas. Hilton, Hyatt, Marriott – the cool kids of hospitality have hopped on board the sustainability train. Destination: the future. We’re thrilled that big players are making small changes to create lasting impact. Without compromising the integrity or comfort of their service, more and more hotel lines, international and homegrown, are hacking the routine modus operandi in order to mitigate harm to the environment, cut costs, and boost their brand reputations. An estimated 2.6 million bars of soap are discarded in the US everyday. That alarming statistic coupled with the information that diarrheal diseases, which can be prevented with proper hygiene, cause 1.8 million deaths per year, is heartbreaking. Organisations such as Clean the World, in partnership with Global Soap, have put two and two together to bridge this illogical mis-allotment of resources and combat hygiene-related diseases. Clean the World literally and figuratively “raises the bar” on global hygiene by collecting discarded soaps from hotels and distributing them to at-risk communities throughout the world. Hilton was the first hotel line in the industry to engage in this initiative, with many more following suit. Let there be light! But also, let there not be unnecessary light. That’s how the saying goes, right? Hotels are cutting energy costs and reducing harm to the planet by monitoring lighting in their establishments. Because, let’s be honest, sometimes when you’re getting turnt, you forget to turn off lights. Hotels counteract the possibility of guests leaving the lights on all day (or all night) whilst hitting the town by installing occupancy and daylight sensors along with energy-saving light bulbs. This way, lights automatically turn off when a person isn’t present, or when there’s enough natural light. A win for business, the environment, and the forgetful patron. Not too hot, not too cold. Everything in moderation (including moderation). By regulating room temperatures and making sure the heating and air conditioning are never too high or too low (and never running simultaneously), hotels can foster a comfortable guest experience worthy of Goldilocks’ approval. And being persnickety about temperature pays off for the environment, and for the company’s expenses. At home, do you machine-wash your towel after every single use? Something about the fun luxury of staying in a hotel puts us in a different towel-mindset (also known as a “towmindset”). So many towels! In so many different sizes! So fluffy! So white! With so many options it’s tempting to use one towel for your body, another for your hair, and one tiny one to dry your pinky toe…and get fresh ones the next day. But as sustainable travellers, we’re responsible for considering the implications of our choices and actions. This same responsibility falls on sustainable hotels. And when it comes to washing towels with less frequency, hotels can conserve a lot of water. 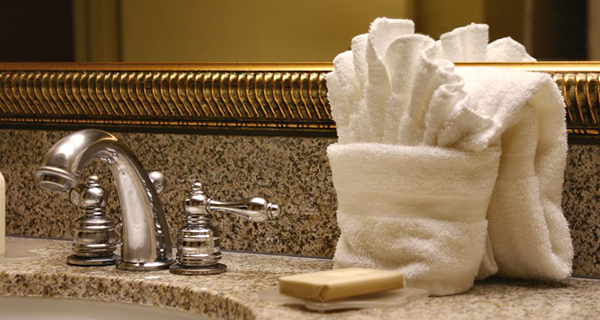 Something as simple as a small sign asking guests to reuse towels has proven effective. Studies conducted through the Environmental Protection Agency’s H20tel Challenge found that the presence of signs requesting reuse helps, but that the wording of these signs matters a lot. Interestingly, signs offering statistics on how many other guests were choosing to reuse towels prove most effective for guests following through. A little healthy competition can be good motivation and good for the planet. The feeling of lying between freshly laundered sheets is a fun treat when staying at a hotel. But for longer stays is it necessary that those sheets be laundered every single day? We don’t think so either. And, as it turns out, neither does the general public. More and more hotels are opting to wash sheets every few days instead of every day. While most major hotel brands will still change sheets every day free of charge upon a guest’s request, very few guests actually request this service (less than 10% of Hyatt guests request a daily change). But of course, they always change them between customers! 50% of hotel-generated waste could be recycled or reused. With the average hotel guest generating two pounds of waste per night, that’s a lot of waste hotels can efficiently re-appropriate. As demonstrated with soap, a little strategic thinking reveals a host of ways to reuse or recycle perceived “waste” so that it doesn’t go into a landfill. With rising prices on waste disposal, this isn’t just the smarter environmental decision, it’s the smarter business decision. Are you seeing a pattern here? Running a green business is all about inspiring individuals to implement small actionable changes in order to collectively conserve in a big way. Making sustainability a part of the company culture is a great way hotels raise awareness, concern, and personal accountability about the environment. Prioritizing green practices in the workflow, incentivising adherence to these practices, and educating employees on environmental protection optimises incremental change that can turn into habit. With a sustainably-oriented work culture at the hotel, the likelihood of employees taking this mindset home with them and to the people in their lives increases. Just as we sustainable travelers take the time to research and vet the impact of our accommodation choices, so do the hotels we choose. An important way hotels go green is by being deliberate in where they source products, from food to furniture. The forerunners of sustainable hospitality source locally and carefully.